When I’m cooking a piece of fresh fish for my dinner I like to imagine it was swimming around in the briny sea that very morning, or at least within the last 24 hours. So you can imagine my disappointment when I opened up some mackerel I’d just bought at the supermarket to find some fillets that were a bit smelly, dry and a little past their best. I’d failed to follow the advice I’m about to give you here. Not only that, but i’d gotten a bit bamboozled at the fish counter. I ordered the fish, then I spotted some nice looking halibut out of the corner of my eye. Next I was daydreaming about the gambas prawns and how i’d like to cook them on a bbq if only we could get some decent weather. When i was handed my mackerel I put it in the basket without checking it. A novice mistake. So did I cook it? Not on your life! Seafood that’s not fresh will be seriously lacking in flavour, have an unpleasant texture, and be really dry when you cook it. Theres nowhere to hide with fish, it’s not like meat. Covering it in a nice sauce, marinating it, or cooking it for longer won’t make the slightest difference. No matter what sort of culinary genius you are it will still taste dry, bland, and a bit unpleasant. Eating a spanking fresh piece of fish is one of lifes little pleasures, and one that’s getting expensive. Seafood in not cheap. Supplies have fallen while demand has skyrocketed because doctors keep telling us to eat more of it. This means higher prices. 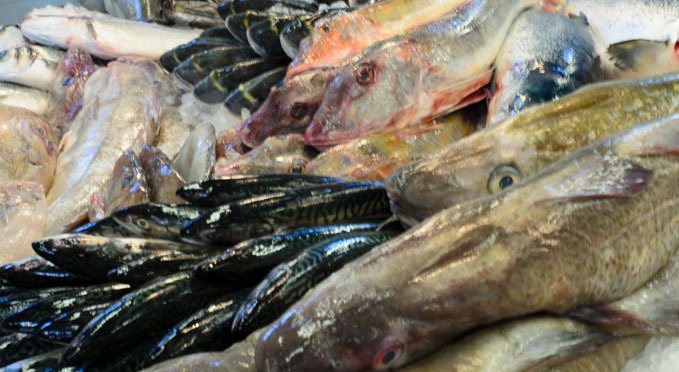 Species like cod and hake that were once considered to be a poor mans meal can now be the same price per kilo as beef fillet. 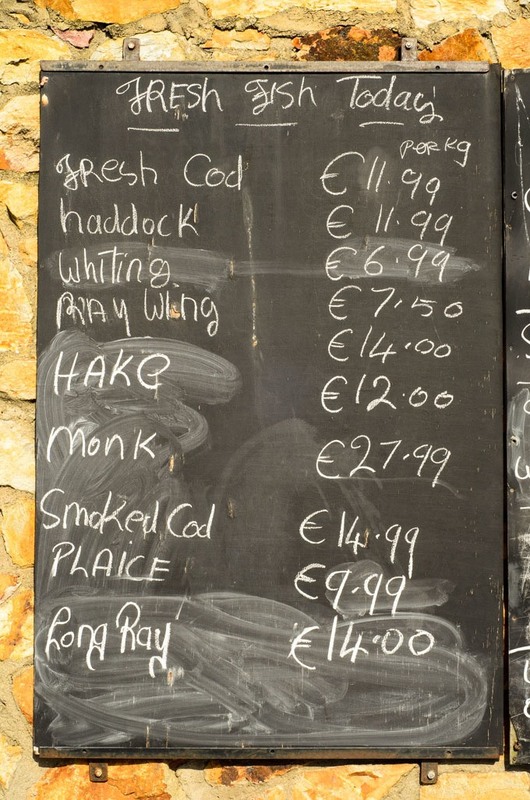 If you fancy a premium species of fish like Turbot, Brill, Lobster, or scallops for dinner tonight (the ones I like to eat when I can afford it) you can now expect to pay over €25 a kilo. Most customers won’t have a clue where a piece of fish comes from. The quality of the fish you put on the table will depend on how it was caught, how long it took to get to the market, and how it’s been handled by the fisherman, wholesale, and retail markets. Even if a fish looks perfectly fresh it might not be of the best quality, for example if it was caught in a depleted state after spawning. Fresh fish is at its best 8/24 hours after its been caught. To understand why, it will help to know what happens when a fish dies. First off decomposition begins. Then lactic acid which is the product of converting energy in muscles builds up in the fish because it can’t be carried away by the bloodstream. This acid causes the muscles to stiffen and what’s called rigor mortis. It’s not a good idea to cook fish that’s really fresh and still in rigor. It will be difficult to fillet and it tends to fall apart during cooking. This is because fish unlike meat has very little connective tissue and what it does have is really delicate while it’s in rigor. If you do happen to get some fish that’s so fresh it’s as stiff as a bord, you’re in luck, because all you have to do is wait a couple of hours till rigor disappears and you’ll be able to cook and eat it while it’s in optimum condition. How long a fish stays in rigor can vary depending on how it was caught. If it was trawled and flapped around a lot then it might only be a couple of hours, because it’s used up all its glycogen and has no energy to convert to lactic acid. When you buy fish you aren’t charged by how fresh it is. You pay by weight no matter what the quality. So it’s well worth your while to buy the freshest you can find. Next time your fish shopping here’s what to look for. Buying fresh fish doesn’t require any great skill it’s really just common sense. I never plan my menu ahead of a trip to the fishmongers, it’s always best to wait and see what’s fresh. Never buy fish that comes pre packaged or vacuum packed. You just don’t know how fresh it is no matter what the use by date says. Wouldn’t it be great if they put the date the fish was caught instead of sell /use by on the packaging. That way consumers would know where they stand and exactly how fresh a piece of fish is. So unless you can pick it up, smell it, and look at it properly and not through some plastic wrap then leave it on the shelf. Don’t buy fillets or steaks that have been stacked on top of each other either. Fish should always be in contact with shaved ice. Plus they will serve you from the top of the pile. When you’re at the fish counter take your time, don’t get bamboozled, and use your senses to find the freshest fish. 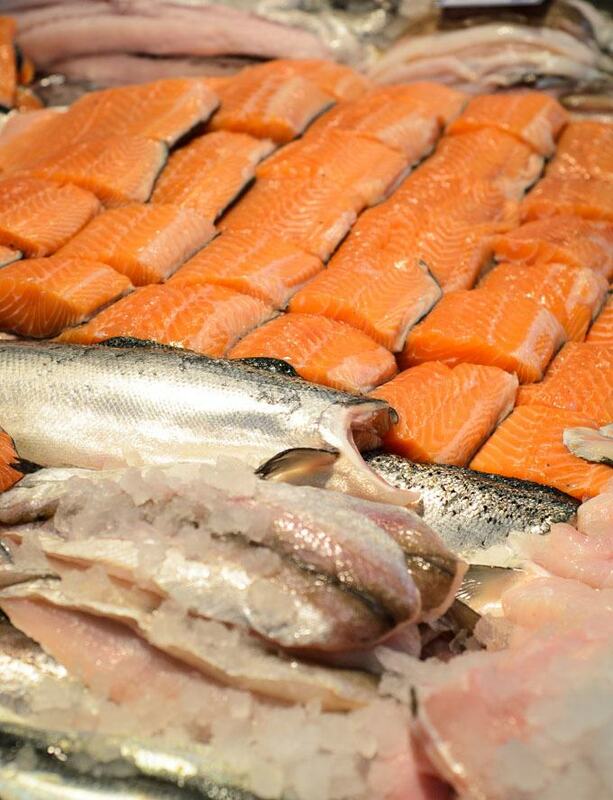 Your nose is your biggest ally when it comes to finding fresh fish. Fresh fish doesn’t always smell like the sweet ocean breeze. It does have a faint smell but one you wouldn’t describe as fishy. A strong, overly fishy smell means there’s been bacterial activity and lots of it. All fish have some natural bacteria in the guts and on the skin that are kept in check by the immune system while the fish is alive (don’t worry these bacteria are harmless to us humans). Once the fish dies these bacteria run riot and start to break down the flesh causing the smell. So the smellier the fish is the longer it’s been out of the water. Cartilaginous fish like shark or skate retain salts in the form of urea. This turns to ammonia as the fish decomposes and if you get a whiff of it, don’t buy it. Fish skin should be shiny, glossy, taut, and have a thin covering of transparent mucus. If this mucus is white or opaque it means the fish has been out of the water quite a while. The scales should be firmly attached to the skin and none should be missing. Older or less fresh fish will have a dull looking, dry and wrinkled skin. While a covering of sea mucus on the skin is a good thing and a sign of freshness. Any on the flesh means the fish is quite old. The flesh of a fish should be dry, quite firm, and spring back into place when pressed. If you’re buying fillets like cod, haddock or salmon the flesh shouldn’t have started to flake apart. Always look for fish with a bright, translucent and plump flesh. A really fresh fish should look like it’s about to wink at you. Its eyes should be bright, clear, and not sunken in their sockets. If the eyes look like they have cataracts it’s a sign that it’s been lying on the fish counter for a good few days. Bright red gills and clear eyes are generally a good indicator of a fish that’s fresh. But this isn’t always the case… It can depend a lot on the species of fish and the temperature of the water in which it lives. Besides, most fish will already have been filleted for your convenience so it’s not always going to be possible to inspect the eyes and gills. If you read this blog then you’re going to be cooking fish regularly. So it’s a good idea to find a supply of fresh fish. 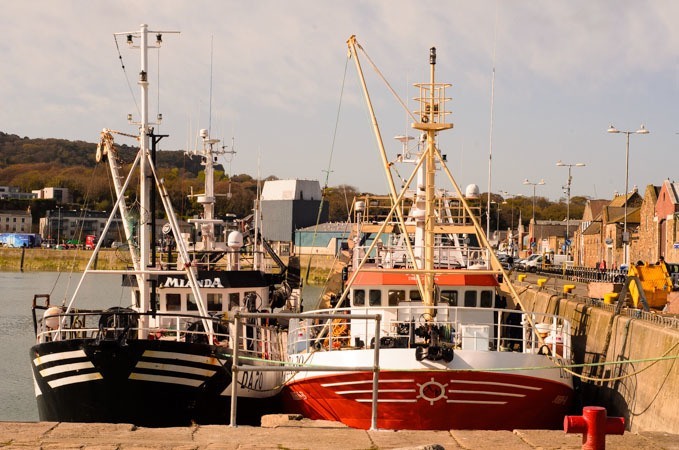 We’re blessed here in Ireland, an island nation surrounded by some of the richest fisheries in the world. No matter where you are in the country you’re never more than a couple of hundred miles from the coast. Our road and rail network has improved so it’s such a pity there aren’t more independent local fishmongers. I’m lucky where I live, there is a great fish monger no more than a 15 minute drive from the house. His fish is top quality, always fresh, and I’ve never had reason to complain. It’s the only fish shop around even though the coast is only about 5 miles away. I hope wherever you are in the world you have access to a supply of fresh fish. Most of us are forced to shop for fish in the supermarket and I used to think they did a pretty good job of creating an appealing fish counter. There is a good variety of fish, though the staff could be a bit clueless if you had any questions. I was shocked to read this, which says that some supermarkets sell fish that’s up to two weeks old. Thats not to say all supermarket chains do this. But the thing about supermarkets is that they buy in massive quantity and purchasing, processing, and filleting is centralised and remote. If you have no other option than to get your fish at the supermarket then ask which days they get deliveries of fresh fish and make sure you buy that day. Its your dinner, you’re paying a lot of money, so don’t be afraid to ask.. Compare this to your local fishmonger who probably gets up early in the morning and goes to fish auctions himself. He hand picks the fish he’s going to buy and spends a couple of hours bidding, before picking up his “catch” and heading back to his shop to start filleting. His aim will be to sell all the fish he’s bought in the market that day in his shop. Guy’s like this are passionate about their trade and would happily talk about fish all day long. They are more knowledgeable and better able to answer all your questions. They will know about seasonality, where the fish they sell comes from, and be less likely to sell fish that’s past its best. You could even ask them for cooking advice. Its well worth developing a relationship with your fishmonger. They will appreciate your interest, and the more you show the better service you’ll get. As a chef before I order fish off a new supplier I would drop in unannounced and have a look around their premises. Heres what i’d be looking for, and so should you if you want excellent quality fish. Smell the air – like i said fresh fish doesn’t really have a smell and certainly not a fishy one. If there’s an overly fishy smell in a fishmongers or at a fish counter turn tail and buy your fish somewhere else. Lots of shaved ice – If your fishmonger displays his fish on shaved ice then he really knows his stuff. Ice is key to maintaining fish quality. The bacteria that live on fish are used to cold temperatures and can still be active at normal refrigerator temperatures (5-7c / 40-45f) Fish stored on ice will be closer to 0c / 32f this will keep fish fresher for longer. Lots of whole fish – If you can see lots of whole fish then its more than lightly they fillet and cut it in-house. This means that it won’t have been done hours or days ago in some processing plant miles away. Whole fish will always be better quality than fillets because there is less surface area to dry out and for bacteria to act on. It’s always best to cook and eat your fresh fish the day you buy it. But if for some reason you need to store it for a day or two, here’s what to do. Buy whole fish and not fillets – They will stay fresh longer. Just make sure the fish has been gutted and the gills have been removed. Make sure the chest cavity is clean and free from blood because bacteria like to hide in there. Turn down your fridge. Most modern domestic refrigerators have a thermostat that allows you to adjust the temperature. You want to keep the fish as close to 0c / 32f as possible. When you buy the fish ask for a bag of shaved ice, most fishmongers will happily oblige. Keep the ice in the freezer and store your fish wrapped in cling film on a plate in the fridge covered in some of the ice. As the ice melts you can drain off the water and replenish it with more ice from the freezer. Remember to do this regularly and its safe to keep it in the fridge for up to 48 hours. Buying the freshest possible seafood you can get your hands on is absolutely crucial if you want to do your cooking justice and make something special for your family, guests or friends. You want that fish in their tummies 24 /48 hours after its been caught. So take your time at the fish counter. Look carefully at each fish. Its eyes, flesh, and skin. Pick it up and touch it if your fishmonger will let you ( some won’t). Finally give it a good whiff. Remember you’re not looking for the scent of an ocean breeze, you’re looking for no smell at all. Top quality fish should look like it’s about to jump back in the water and swim off on you. After a while you’ll develop a sixth sense and be able to tell if a fish is fresh by just looking at it. If everything is in order pay your money, hurry home, log on to Cockles N’ Mussels, pick a recipe, and get cooking.